Jace passed the next few days in a happy haze. Pleasantly busy and active, but constantly distracted by the sheer noise of it all. The Belligerent creaked and moaned as she sailed. The crew sang and laughed and relayed orders. But above, around, and inside every sound was an undercurrent of conversation. Even when his ears couldn't hear anything, Jace could still hear endless talking. It was irritating, and Jace ultimately decided the best solution was to drown the noise out with activity. He set about making a place for himself among the crew and relished learning new tasks and techniques. Amelia, quartermaster and one of the two helmsmages, was more than happy to demonstrate. She would adjust the mainsails and ropes with magical ease then briefly change direction with bursts of wind to challenge Jace to adjust the course. Kerrigan, the burly orc who served as ship's cook, showed him how to maintain a galley-fire without burning the ship down. Gavven, the boatswain, showed him the contents of the ship's hull (only after hours of pestering). And all the while, Jace devoted an hour each day to practicing his own talents. Over the course of his month on the ship, his illusions had grown more detailed, more convincing. Five days after their successful raid, the crew landed at High and Dry with no need for expensive supplies. On the captain's orders, the crew of The Belligerent disembarked for rest, relaxation, and more than an insignificant amount of revelry. Jace could never have imagined a place as different or exciting as what he saw when he stepped onto the dock. The planked streets of High and Dry were the remains of thousands of broken Brazen Coalition ships. The town itself, built on a series of floating platforms, was a neutral ground where pirates could meet and trade goods, tools, treasures, and stories. It was a small empire of favors and obligations, a place where travelers could find their needs, treat their pleasures, and forge lasting alliances. Jace had been told that, before the Legion of Dusk's arrival on Ixalan two years ago, this had been a place untouched by the war at home in Torrezon. Amelia clapped Jace on the shoulder. "Jace! We're heading to the Burning Port for ale and cards! You in?" Jace shrugged and smiled. He felt a tap on his shoulder and turned to find Breeches, a goblin as talented at knot-tying as he was at yelling. "ALE AND CARDS! ALE AND CARDS!" he chanted with fervor. Amelia nudged the goblin with her leg. "Oy, you owe me for last port, Breeches, so no chanting yet." The helmsmage wagged her finger. "Debt and ale and cards, Breeches." Breeches paused and pulled two coins out from under his hat. "DEBT AND ALE AND CARDS!" Amelia pocketed the coins and nodded in approval. Vraska strode up and nodded at her crew. "Apologies, Breeches, Amelia, but Malcolm and I need to consult with our newest crewmember." Amelia and Breeches nodded in understanding. 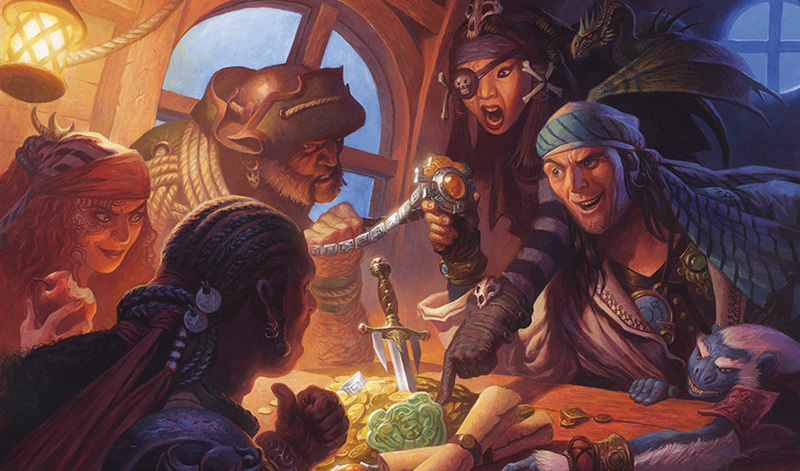 Vraska continued, "But we will rejoin the crew afterward for festivities." Breeches pumped a fist in the air. "DEBT AND ALE AND CARDS AND FESTIVITIES!" Malcolm fluttered to their side, a mischievous look on his avian face. "Captain, Beleren, this way, if you will." They said their goodbyes and followed Malcolm away. The siren led Jace and Vraska along one of High and Dry's narrow, half-tilted streets toward his favorite watering hole. The air stank of low tide and seagulls laughed on the tin roofs. The shops and taverns they passed buzzed with the laughter of pirates, and firelight from oil lamps hanging from the eaves flickered a path for them to walk. Malcolm pointed out a nondescript building hanging off the side of one of the docks. A ragged sign was hung out front. In peeling letters it read "BOATSWAIN'S REAR." "It's a gem," he said with saccharine pride. He opened the door (an old galley table with a knife still stuck in it) and happily marched toward the bar. Vraska and Jace followed him in and found a table. Jace looked around and was overwhelmed by the strangeness of the place. The walls were coated in smoke stains, and sad little oil lamps illuminated a sadder series of crowded tables and half-broken chairs, each stuffed with the most degenerate villains one could imagine. The goblin bartender looked up at the newcomers with one lone remaining eye and spat forcefully into an upturned hat. Vraska gave Jace an uncertain look, not knowing what he would make of the establishment. "You all right with this place?" Jace looked back in wonderment. "It's fascinating." Malcolm arrived with drinks for the three of them and they each raised a glass in celebration of their teamwork. 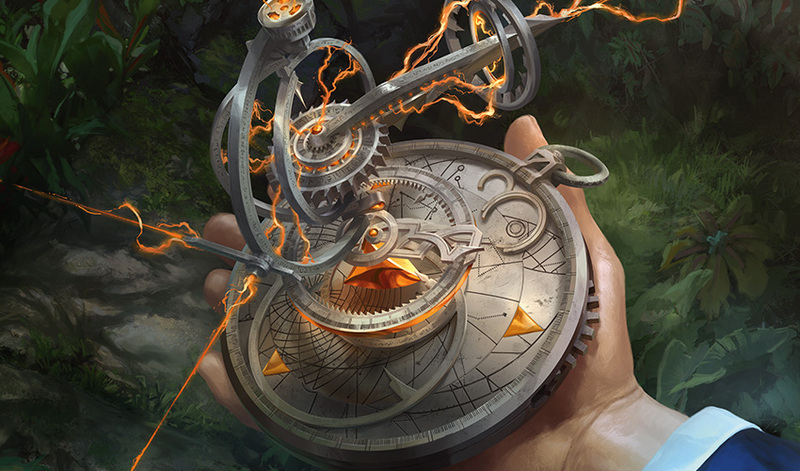 Halfway through the round, Vraska pulled a compass from her coat and put it on the table. "You should know, Jace, that we are currently engaged in a special assignment." Jace's heart leapt. He had been dying to learn what this mission entailed. "It began about five months ago. I was contacted by a wealthy patron from overseas, not part of the Legion of Dusk. His name is Lord Nicolas, and he hired me to retrieve an item of great power." Jace picked up the compass. There was no marking for direction, only several needles made of gently flickering orange light that pointed resolutely in several directions—none of which were north. He handed it back to Vraska, who continued with gusto. "He told me to make for the continent of Ixalan." She leaned forward and spoke in a private tone. "The thaumatic compass is enchanted to find a place of power: the forgotten city known as Orazca." Jace startled and whipped around. He briefly locked eyes with a green-finned merfolk sitting on the far side of the bar. The merfolk stared back in surprise. Jace frowned. He could have sworn he heard protest. He turned back to his friends, who looked back for an explanation. "I thought I heard something. I'm sorry." He folded his hands and waited for Vraska to continue. "No harm was done," she said. Malcolm nodded. "The object we're after is in Orazca, and it is known as the Immortal Sun. It used to be kept in the monasteries of Torrezon, in the kingdom that would eventually become the Legion of Dusk. For generations, it remained under the protection of its holy custodians in the mountains of the eastern continent. "Its presence gave the old rulers incredible power," Malcolm continued. "Jealousies blossomed, and Pedron the Wicked's forces broke into the monastery where the Immortal Sun was kept safe and stole it. As they departed the sanctuary, a winged being descended from the sky. It took the Immortal Sun, carrying the relic across the sea and into the west. No living being knows its exact location, but this compass is meant to help us." Vraska finished her drink. "We just don't know how." Jace held out his hand, and Vraska placed the compass in his palm. "It changes direction frequently. It's how we found you, you know." Jace gave her a flat look. "I'm not a Golden City." "Obviously," she smiled. "But maybe you can figure out how it works, so we don't get thrown off by a distraction again." "I like to think I'm not a distraction either." "No." Vraska had a conflicted look in her eye that Jace couldn't quite read. "You're something else entirely." Malcolm purposefully coughed. "I'll take care of this round, then. Meet you back at the ship." Malcolm returned to the bar to pay, and Jace and Vraska stood to leave. Jace caught one last look at the merfolk in the corner, who averted their eyes sharply as he passed. The night was warm and thick with the scent of traded goods. The sweet aroma of exotic spices lingered in the air, and Jace walked back along the wood-planked streets toward their ship with his captain. "Vraska, do you know if I can read minds?" The question sounded as stupid as it felt, but it stopped Vraska in her tracks. She let out a two-ton sigh. Her answer was silent, but her voice was clear in his mind. Jace's jaw dropped. "Why didn't you tell me?!" Because I didn't want you being rude and reading my mind without asking, she thought with a tired glare. He paused, backed his mind away from her thoughts, and looked down the street at the dozens of strangers in High and Dry. It was as if a chain in his mind had gone loose on its gear and suddenly snapped back into place. The sounds and the voices were so obvious now. The people that passed, the birds that flew overhead—each of them had a mind as fragile and precious as crystal. They appeared in the senses of his mind as exquisite structures, and if he wished, he knew he could turn them over and inspect their insides like a statue made of blown glass. "Minds so delicate," he said, stepping out of the way as a small group passed them on the avenue. "Their structure is form, but also sound. Like an orchestra contained in crystal." "What is it like to hear them?" Vraska asked. Jace couldn't put it into words. "It's . . . noisy. Like a sea of champagne glasses and each of them are ringing a different tone." They rounded a corner and headed toward the harbor. Now that he was aware of what the snippets of voice and conversation were . . . he sensed he could turn off the noise. And the mental voices silenced. He could still sense the gauzy, elaborate but breakable structure of the minds he passed, but they were silent now. 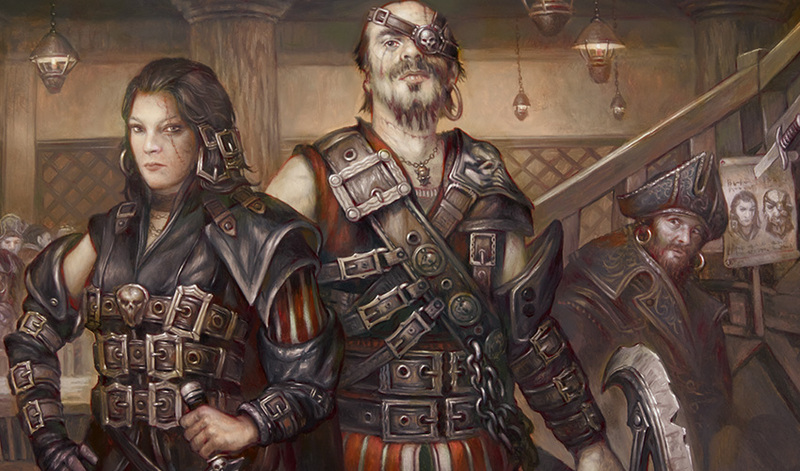 "No reading my mind or the minds of my crew," Vraska said, "But everyone else is fair game. Except our employer, but I think he may be a better telepath than you." "Do I know him?" Jace asked. Vraska went quiet for a moment as they walked. Vraska crossed her arms. "We're from a large city." Distantly, he could have sworn he heard her thought process and knew somehow, that in truth she had no idea if they knew each other or not. The street they walked on opened into the air of the harbor that surrounded High and Dry. The lines and sheets of dozens of tall ships crisscrossed the night sky ahead, and a waxing moon was silvery above. "What is the city called?" Jace asked. He caught the slip of a smile on her lips. 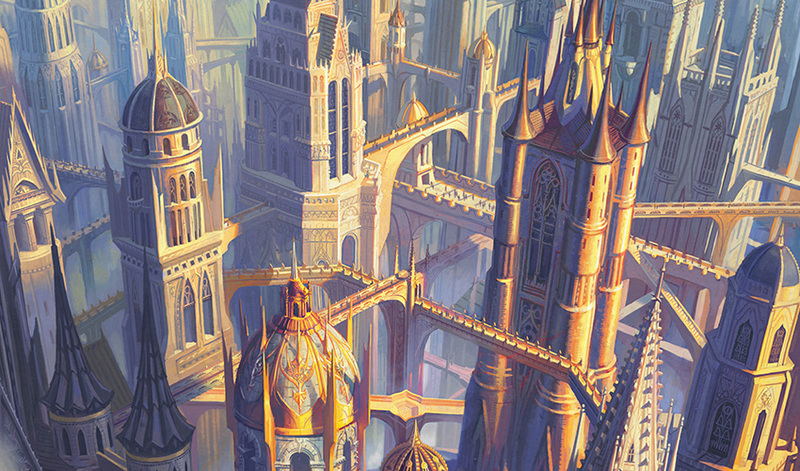 "Ravnica." "And I was a politician there?" Vraska chuckled. "You were horrible." "I imagine. I must have been forced into the job." A sly smile tugged at her lips. "You weren't forced into anything. You had a great big campaign!" she said. "Flyers, stump speeches, banquets to fundraise. 'Jace is Ace!' was your slogan." "'Jace is Ace' is an awful campaign slogan." "Yep. It was totally yours." Jace's skepticism deepened, but he smiled nonetheless. He purposefully slowed down his pace. He didn't want to reach the ship yet. Vraska matched his speed, and his heart sped up a bit. "What was our old city like?" Jace asked. Vraska tilted her head in thought. "It is massive. Soaring towers and bridges that cross over layers and layers of city. It is colder than here, and it snows in the winter." Jace wished he could see it. 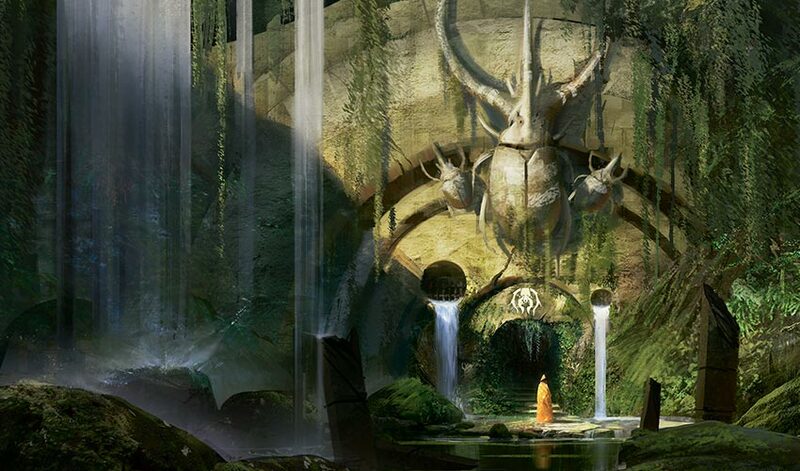 In his mind, he had a vague impression, and in the periphery of his vision, he sensed an image dominating the surface of Vraska's mind and saw. Jace stopped, and Vraska stopped alongside him. He tried to find a word but landed only on silence. Instead, Jace looked up, eyes alight, and showed her. The stars above shifted position. The moon began to wane and moved to the other side of the horizon. The ships grew taller, coated themselves in dark stone, and their masts and posts reached into the sky until they were tall as towers, with spires that scratched the stars. The shoddy buildings of High and Dry rumbled against each other and rose to form basilicas and cathedrals, pointed arches and ribbed vaulting. Fluffy, gentle flakes began to drift down from a sky as gray as wool. "Is this it?" Jace asked, voice quiet as the snow. Vraska's response was just as soft. "Yes. This is Ravnica." Jace smiled and watched the snow fall. He looked back at Vraska and saw her staring up in wonder. She crossed her arms tightly in front of her. Her guard was up. "You were projecting it loudly," he said, "I apologize for overhearing." "Just don't do it again," she said tightly, her gaze still locked on the majesty of the illusion-city around them. The acerbity of her warning did not match the sad look of homesickness heavy in her eyes. It took every ounce of Jace's self-control not to brush her mind for a look at what she was feeling. "I wish I could remember it," Jace said. "It looks like the greatest place in the world." "It is the greatest place in all the worlds," Vraska murmured. Jace sighed. Best not to stare at an illusion for too long. He vanished the cityscape, watching as the towers dissolved back into tall ships and the buildings collapsed back into lean-tos. The illusion vanished. But the look of guarded wonder on Vraska's face remained. And so, in his way, Jace told her. "Will you teach me more about Ravnica?" he asked. She turned, arms still crossed, her mouth a firm line. Jace smiled. He didn't mind waiting. They returned to an empty ship and sat on the deck in chairs Vraska had dragged out from her quarters. They briefly spoke of returning to town for "debt and ale and cards and festivities," but decided the combination sounded a tad overwhelming and elected to stay home instead. Jace had learned by now not to press for answers, but the urge never truly went away. There was so much he did not know, and he hungered for anything that might give him a clue about his past. Vraska leaned back in her plush chair and put her feet up on the ship's railing. Jace pulled his own chair alongside hers and did the same. "So what's it like knowing you're a telepath?" she asked, staring at the stars. "Realizing I am an illusionist was delightful. Telepathy has more . . . teeth to it." Jace crossed his arms and stared upward at the sky. "Minds are absurdly delicate. Everything that makes a person who they are is as fragile as a cobweb." "You're a sledgehammer surrounded by cobwebs," she said plainly. "You realize that, right?" "A goddamn sledgehammer," Jace mused, a little pit of dread opening in his guts. Vraska chuckled. It was the first time she had ever heard him swear. For the first time since he arrived, a half-memory itched to resurface. A massive lion with a man's face, eyes wide with horror, wailing like an infant on the rainy ground as he gasped for air and his wings dumbly thumped the ground. A dream? An impression? It did not matter. It did not feel real. A random expression of imagination to keep to one's self. "I wonder how many minds I have broken before," he said aloud. Jace's breath caught in his chest. "Vraska . . . do you know if I've done that?" He looked over at her. Her eyes were looking upward, her lips a firm line. She took a breath. Jace had explicitly not allowed himself to read her mind, but could almost sense it whirring around an old and frightening feeling. "Could you redeem yourself if you had?" she asked in response. The question was cautious, atypically small for someone so bold. "To ruin a mind is to deliver a fate worse than death, I imagine." He said. "You are asking if there is redemption for those who kill." Jace chose his words carefully. "Existence is adaptation to changing circumstances. The self is an accumulation of what one has learned from those changing circumstances . . . Our agency gives us the means to alter our own path. You are who you decide to be. And who you will become depends only on how you choose to adapt." Jace realized Vraska had been looking at him. His face felt flushed, and he was thankful his blush did not show in the starlight. The waves lapped against the side of the ship. "Is your past truly that unimportant?" she asked. Jace shrugged to himself. "It has to be. If I can do what I think I can, I've hurt a lot of people. But it's the future that makes me who I am, because my choices will influence who I become." The silence didn't bother Jace. He had decided that small-talk was a largely overrated social ritual, which made it all the more lovely to spend time with someone who embraced the natural silences of good conversation. "I wish I could forget like you have," Vraska said, hushed and small. "What do you wish you could forget?" asked Jace. Vraska's gaze was distant, locked on the horizon. Jace knew immediately he had said both the wrong and the right thing. Her response was terse. "Prisons." Prisons in the plural. Vraska's gaze was distant. She clearly did not wish to revisit the memories he had stirred. He stood, but Vraska remained still in her seat. Jace was struck with an idea. "Let's go to the galley," he said. Jace led Vraska off the deck and down the ladder into the galley. He motioned for her to sit on a nearby stool and shoved a few logs onto the coals of the galley-fire. He grabbed the kettle from its place in the cupboard, filled it with fresh water, and set it on the stove. It was clumsy and took a moment, but Jace did it in precisely the correct order. He poured the final product into a mug and handed it to Vraska. She sat for a moment and looked at her tea as if Jace had given her a precious jewel. Vraska wrapped her fingers around the mug and let out a breath. She took a brief sip, and Jace saw her lips twitch in approval. She was still looking at the cup with wonder. After a moment, she spoke. "We come from a faraway city." Vraska laced her fingers behind the coils on her head. "Very far away. The rest of the crew has never heard of it." Jace did his best not to ask six questions at once. He landed on the most pressing. "Why haven't they heard of it?" "It's that far away." She glanced briefly at him. "You're just going to have to go with me on this one." There's more there, but fair enough. Jace nodded, and Vraska continued. "The city runs like cities do, and different guilds are in charge of different functions. The Orzhov run the bank, the Azorius make the laws, et cetera. There are ten guilds total. The Golgari technically run refuse and rot farms, but it's really a catch-all for those who fall through the cracks. Outcasts and scoundrels and what-not. "When I was much younger, the Azorius issued a mass arrest warrant for members of the Golgari guild. The Golgari hadn't done anything; they simply existed, and the Azorius decided they were criminals. They assumed I was Golgari because I was a gorgon, and they arrested me too. They packed us into a prison. I was there for . . . a while. I'm not sure how long. The Azorius would joke that we lived underground like moles, so why would we need windows to see the sun? There were no beds, little food. Violence was our negotiating tool, and oh. How I wish it could have been me leading those uprisings. We would riot, and they would move us, then hurt us. Riot, move us, hurt us: it was an endless cycle, and eventually they kept a blindfold on me so I could not petrify my captors." Jace hated everything about this. There was nothing he could fix. As much as he hated it, there was no logic in trauma. He did not know if he were in her position what conclusion he would arrive at to give peace to his mind, what theories he would tell himself to reason his way to comfort. Vraska's golden eyes had a faraway look to them. "You lose track of time in a place like that. Eventually they took me away. Locked me up alone in a room with no cot and water up to my ankles. The beatings continued, and whatever wounds they left would stink with infection for weeks after the fact. When they eventually took the blindfold off, I thought about trying to petrify myself to make it stop. But I wanted out more than I wanted to end." Jace felt ill. He did not cross-examine her, nor did he demand proof, nor did he ask for clarity. Now was not the time. It was his job to listen. Vraska was doing her best not to make eye contact. "I remember the night I nearly died. I was bloodied and broken, and I knew that one more hit to the head would do me in. My body knew what to do, and I used magic I'd never used before to escape. But the place I escaped to was a prison, too. I was trapped there, alone, for quite some time. Just me and all my memories of the source of all that cruelty." Vraska had finished her tea. A few bits of leaf were stuck to the inside of her cup. "'A person should die the death they deserve.' I lived by those words for quite some time. They gave me comfort." "Do they still?" Jace asked. Vraska's mouth was a hard line. "Yes." "The part I haven't figured out yet is if they all deserve to die," Vraska said after some time. "My magic may lie in death, but I take no joy in killing. Before, I did it because I didn't have a choice otherwise. Now I have to do what is right for others like me." "No," she said. "By leading the Golgari when I get home. Our employer promised me the position of guildleader upon my return." Jace smiled. "You've already proven you have what it takes. The best leaders understand the communities they are trying to protect. I think you were meant to be a great leader." Vraska's looked oddly sad at that. "Vraska . . . ?" "No one has ever really said that to me before." How could she not see what she had already accomplished? Jace's brow furrowed. "Do you think you don't deserve it?" She sighed. "I don't know how the Golgari will see me when I return." Jace shrugged. "You get to decide how they see you." She looked at him with uncertainty. Jace continued. "How we engage with the world is dependent on how we present ourselves to it. We are continuously adjusting to change because if we fail to change, we fail to survive. By nature of you surviving the hell you did, you have changed into someone wiser than before. By nature of you commanding this ship, you've transformed yourself into the leader you always knew you could be. "What makes you you isn't your circumstance or your past, but the choices you make in the future. Your ability to learn and adapt is what makes you who you are today, and that is what dictates who you will continue to become. Vraska, your greatest vengeance is the fact that not only are you alive, but you reinvented yourself into someone stronger than your captors ever thought possible. Do you realize how incredible that is?" Vraska was smiling an uncharacteristically bashful little smile. It reached the creases of her eyes. Jace smiled back. "It's true. To have been through all that and come out the other side is something I doubt I could have done." "I don't know," Vraska replied. "It's not obvious at first, but I think you have more grit than you give yourself credit for." "Even if I do, I've forgotten when I demonstrated it." Jace gave her a serious look. "Thank you for sharing your story with me. I'm proud to know you." He saw the outline of her mind but dared not peek inside. It was curves and nooks and swirls of delicate glassy strands. Vraska had no idea how fragile her mind was, just as he had no concept of how easily she could turn him to stone. Vraska grinned. Jace felt his cheeks warm. Both of them realized at the exact same moment that neither of them wanted to hurt the other. Her smile was earnest and open. "I'm proud to know you, too, Jace." The weeks passed pleasantly for the crew, and the closer The Belligerent drew to the continent, the more excited they became. Vraska's story was still running through Jace's mind. He had made her another cup of tea that night, and they had talked of happier things. She trusted him enough to tell him that story. That trust warmed Jace's chest like whiskey. That gentle warmth urged him to unravel the mystery of the thaumatic compass as quickly as possible. For weeks he stared at it, paged through navigational books, and picked at Malcolm's patience to gather information. Eventually, he came to a realization: if the compass had changed direction the day he had been rescued, it must have reacted to some form of stimulus near him. And there had only been one eventful thing that happened in the hours before he was rescued. One afternoon, hours before they made landfall, Jace took the compass in hand and made his way down to the brig. It stank, and there was water up to his ankles. But he needed privacy. The ship began rocking to and fro. He thought the sea must have turned stormy since he made his way down. The thaumatic compass was turning out to be more involving than initially expected. It was such a complicated thing, with several lights pointing in several different directions. He shook it a little, and one of the lights flickered. It was intriguing enough that Jace decided to do something reckless. He took a small tool from a storage crate nearby and began to disassemble the one device that their expedition needed the most. It was easy, like the telescope several weeks prior. He laid it out, piece by piece, assembling a simple grid of components as he worked his way inward. At the compass's center, he saw a small gear loose on its axis. He tightened it, then reassembled the compass. A single light shone from one side of it, now, brilliant and clear in a single direction. And now, for the most important test. Jace set the compass on a flat crate, closed his eyes, and concentrated. He felt down and back in his mind toward the strange part of himself that made him him. He took a deep breath and reached for it. And felt his body break apart and away and slam back together, with the familiar triangle appearing above his head once more. Jace blinked, slightly dazed, and looked down at the compass with anticipation. He nearly cheered in joy. The needle was pointing directly at him. His theory went thus: the thaumatic compass worked by pointing toward a very specific type of magical expression. Small illusions didn't move the needle, but whatever it was that Jace could do (with effort) did. If his theory were true, then the Golden City would have to be a massive hub of magical energy—and this compass would point directly toward its source. 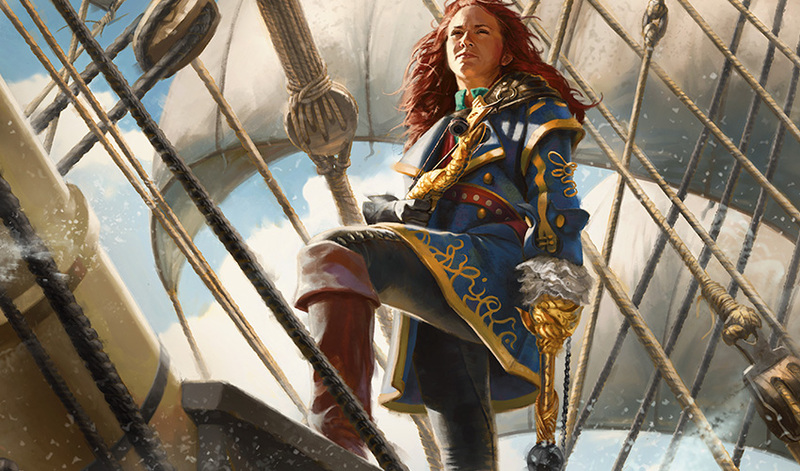 Jace scooped up the thaumatic compass and hurried out of the brig and up two sets of ladders to the deck. "Vraska! I figured out the compass!" Jace's yell was drowned out by a sudden rumble of thunder in the distance. The sky was an angry gray, and the crew was rushing to prepare for a storm. Vraska stood atop the quarterdeck, staring upward. Malcolm was high above, getting a better look at something in the distance. He swooped back down and conferred with Vraska. Jace did not want to interrupt, so he waited for a chance to ask what was happening. A moment later, Vraska spotted him. "Jace! Get below deck. A Legion of Dusk ship is approaching, and there's a thunderstorm ahead." "I thought we were making landfall today?" "Yes. That too. All three of those things. I need to make sure they don't happen at the same time." Suddenly, the sky opened, and torrential rain began to fall in sheets onto the deck of The Belligerent. Vraska grabbed Jace's shoulders. "Get below deck!" Lightning crashed, and the ship lurched violently sideways. A wave rose high in the distance, and Jace saw the Legion of Dusk ship coasting atop the water. It was massive, larger even than the one from several weeks before, with two dinghies suspended from either side. The wave The Belligerent rode rose in turn, and Jace looked into the distance at a massive wall of green. The shores of Ixalan were there, a pristine bay rimmed with sand that led to a large outcrop jutting into the sea. Dark clouds churned in the sky, and more and larger waves threatened to overturn the ship. Risk lightning and conquistadors, or smash into the rocks onshore. They were caught between two unfavorable options. Jace shoved the compass into the safety of his pocket while Vraska called out orders. "Secure the cannons and put out the galley-fire! Reef the mainsail and heave to!" The ship lurched once more, and a crewman tumbled into the sea. Jace watched as Vraska weighed her options. She looked to shore, and then to the rest of the crew. "Abandon ship!" 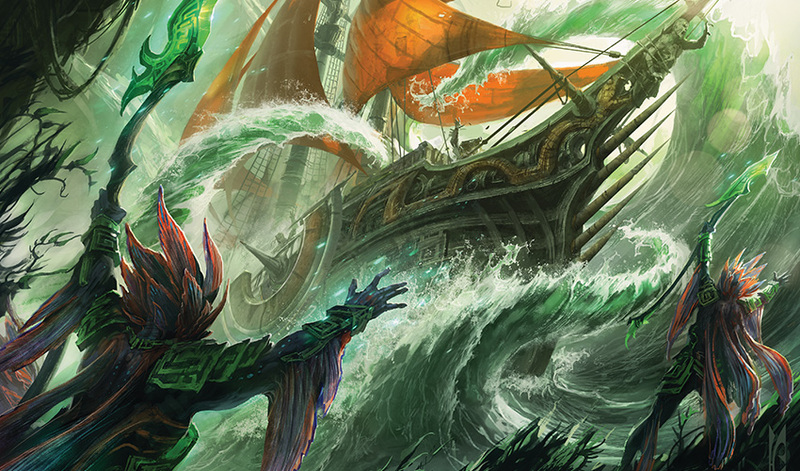 she yelled, "Abandon—"
A wall of water crested the side of the ship and slammed into Jace and Vraska. They reached for one another as the water began to sweep them off the deck. And The Belligerent rammed into the rocks.